What’s your first reaction when someone starts talking about politics – not politics as it relates to national governance, but the politics that happen within your organization? Do you shudder and think to yourself, “I hate politics” or “I don’t do politics?” Your negative reaction may be based on the assumption that all politics involve unethical actions or unethical goals. But, it is possible to engage in politics by using ethical means to achieve an ethical objective. At its core, organizational politics are simply about getting things done when there are limited resources and stakeholders with varying interests and agendas. It requires emotional intelligence, and listening, influencing, and negotiating skills. It requires quality relationships, credibility, and a reputation for trustworthiness. Don’t let a faulty assumption hold you back. Develop your political skills to achieve important organizational goals. 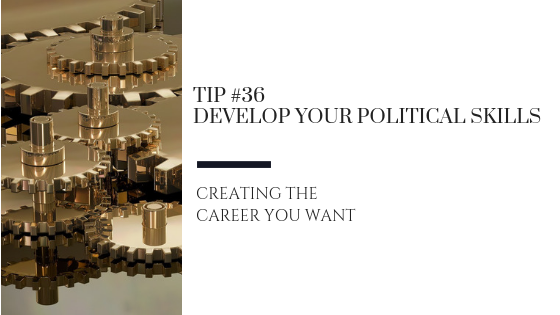 As with so many of the skills needed to build a thriving career, political skills can be developed through experience, observation, and conversation. Is there an individual you respect in your department who always seems to be able to get things done? Someone who is skilled at getting departments to work together towards a common goal? Spend some time observing that person. Meet them for coffee and ask them how they have done it. If they’ve worked with you on a project, ask them for candid, constructive feedback about the way you interacted with others, and what you could do better or differently in the future. Look for opportunities to influence those around you on a smaller scale, and notice your confidence and comfort grow as you develop your own political skills.